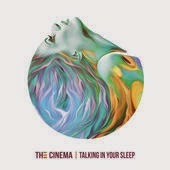 It's been three years since the techno pop duo The Cinema have released a full-length album. Today they finally confirmed that their next album will be released on December 16th. After a year of teasers and audio clips of different projects, fans are anxiously checking off those 47 days—not that we're counting the hours or anything. The album is currently titled Talking In Your Sleep and will feature ten catchy songs such as "Ghost" and "Dancing Round Me." They have already announced that States singer Mindy White will provide gust vocals on at least one of the tracks. The first single, "Call It In The Air," has already been released and can only be heard here. The album cover has a picturesque feel that brings back memories from old-school Lydia albums. 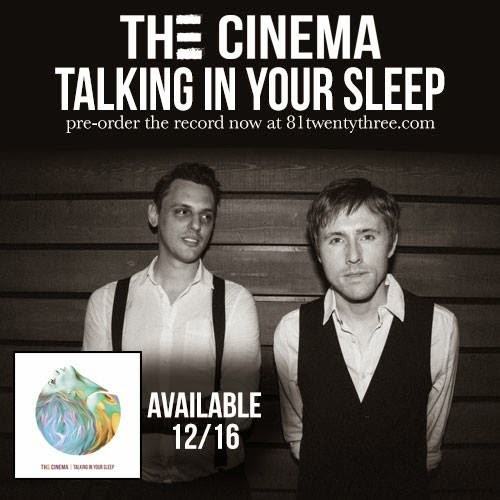 If you aren't familiar with The Cinema, it consists of Leighton Antelman of the band Lydia and producer Matt Malpass. Their collaboration is a perfect blend of Antelman's vocals and Malpass' techno pop edge that will take workouts to a whole new level or at least give you something to sing in the shower. Their first album, My Blood Is Full of Airplanes, is available now at iTunes. Excited about the new album? Please leave your comments and tell us what song you are waiting for.